Like double decker buses, two game changing announcements have arrived simultaneously to shake the future of the mobile payments industry. With eBay's decision to spin off its payments business PayPal arriving on top of Apple's unveiling and rolling out its Apple Pay system (at least in the US), it's a fascinating time for industry watchers. The magnetic strip has been in use by shoppers' credit and debit cards for five decades, but technological developments look set to take payments into a new sphere. PayPal has laid solid ground in the mobile payments stakes, while Google Wallet has struggled to make a big impact. However, there are two solid reasons for arguing that Apple Pay will take cashless payments mainstream. Firstly, Apple is one set of products, not hundreds of different ones of varying quality like the Android platform that Google Wallet currently sits on. The design and style ethos of Apple means that its products are bought by those with a higher than average income, and those people already download more and spend more on apps. Secondly, Apple has a strong history of going into stagnant markets and revamping the business model, as it did by turning illegal downloading into a successful paid-download platform at scale. 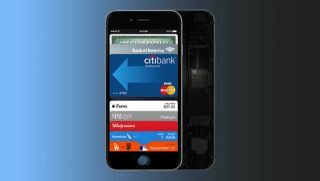 With 83% of US banks on board as well as key online retailers and offline stores, retailers and financial partners seem to be backing Apple Pay in becoming a leader in mobile payment. Certainly, with 800 million credit cards on file, all of which can be used in its virtual wallet, Apple Pay via the iPhone 6 and Apple Watch is in a great position to reinvent contactless payment as we know it. Apple Pay works in the same way as contactless payments currently do with credit and debit cards. The phone uses NFC (Near Field Communication) to communicate wirelessly with point-of-sale NFC devices to transact a payment to the retailer from the stored cards in Passbook. What's more, having NFC on the Apple Watch and iPhone 6 will mean retailers can use the technology for more than just mobile payments. In the near future NFC could be used as a secure way of opening click-and-collect lockers in-store and at other locations such as train stations. Apple device owners could also use it in-store to collect orders that have been placed in advance. For example, users could order a coffee in Starbucks, a meal in a restaurant or drink in a bar in advance, and confirm payment when they reach the store or venue simply by swiping their phone or watch close to the NFC contactless reader. However, success for Apple Pay is not without its challenges. Perhaps one of the biggest barriers to achieving mainstream success will be convincing people to upgrade to an iPhone 6, or to spend upwards of £220 on a connected Apple Watch to make the iPhone 5 Apple Pay compatible. Apple has relied heavily on loyalists upgrading phones and users upgrading to the latest OS, but in an increasingly saturated Western market, can it drive new sales in sufficient enough volume to make Apple Pay adoption work? The battle between Apple Pay and PayPal finds the mobile payments sector at a crossroads. Whether there is one winner, or whether both can coexist, mobile and cashless payments are set to be a hot priority for brands and retailers alike as we approach 2015. Viv Craske is head of planning and digital at Live & Breathe.